Seneca Wallace went down in the 1st quarter of Sunday’s game against Philadelphia with a groin injury. Flynn won’t need directions around town. He was the Packers 7th round pick in 208 and spent four seasons backing up Aaron Rodgers. Flynn worked out Monday morning for the Packers and signed Monday evening. The Packers will have to make a roster move sometime today. They could make room by putting Seneca Wallace on injured reserve. Scott Tolzien will be the starter for the Packers against the Giants on Sunday with Flynn serving as his backup. Now the Packers will formulate a game plan with Tolzien getting most of the snaps in practice, something he didn’t have a week earlier. 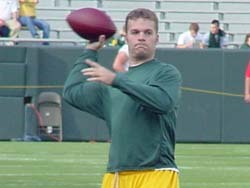 Since leaving Green Bay as a free agent after the 2011 season, Flynn signed a 3-year deal in Seattle worth $19-million. The Seahawks eventually traded Flynn to the Raiders after he couldn’t beat out Russell Wilson for the starters job. Flynn was then beat ut by Terrelle Pryor for the starters job in Oakland and he was released. Buffalo then signed Flynn on Oct. 14th and released him Nov. 4th.